Does not drop any loot. Strange mob this.... Was doing a quest killing all the mobs around in the area, and came across this non elite.. realised after starting the fight that she should be marked as an elite (hits pretty hard and has 16k health). Thought it might drop an item that starts a quest or something, but after killing her on my main to get revenge she dropped nothing. Pretty annoying, should really be marked as a horde npc (flags you pvp if you try to attack it). She should probably be marked as an elite…I was very dismayed to pull her thinking she'd be just like any other mob I was killing and find that I was barely making a dent in her health. Hits 375s on plate at level 60, so seems like she's been nerfed a little compared to other comments, but still has 16k hp and is not marked an elite. It seems this NPC no longer gives quests. Bummer, I was looking forward to one of her quests rewards. 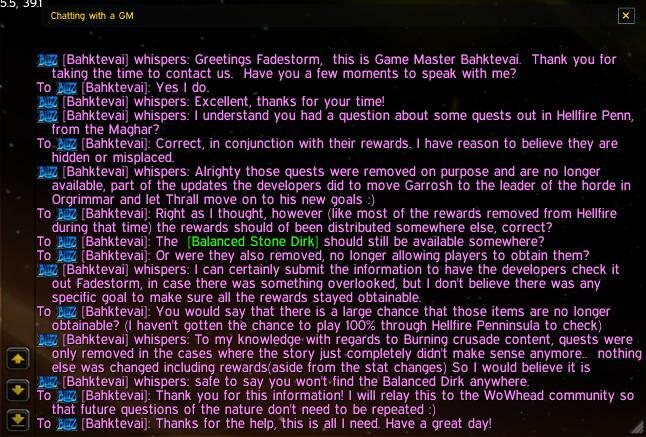 Unfortunately as of Cataclysm Earthcaller Ryga' quests (and most of the Hellfire-Mag'har quests) were removed from the game. They are no longer obtainable or available for completion. ok sooooo not nit picking or anything just let me get this straight, they removed this NPC and most of the hellfire peninsular Mag'Har quest lines to fit in with Garrosh Hellscream becoming Warchief ? As of 5/9/12 this NPC had the quest(s) for me. Not sure if they have either put them back or if it's due to my exalted status with the Mag'Har. As of now. When you come with the spirit wolf to Gorkan Bloodfist, she is still talking to it even though she is not spawned.